Scribblenauts Unlimited: Man Was Not Meant To Have Such Power. Way back in the day, before I had a decent Internet connection and Steam, I was something of a handheld gaming fiend. I can remember my GameBoy fondly, it was a giant device in my little hands and I had but one game to play on it: Nigel Mansell’s World Championship Racing. I kind of skipped the next couple generations of handhelds though (unless you count playing the demo unit at work) but I did have a PSP for a long time, one that was modded to heck and back. I even bought my wife a Nintendo DS as a present which is still loved to this day but more for its utility value than a gaming platform. The end result of this is that while I was aware of Scribblenauts I never really bothered to check it out. That is until it became available on Steam late last year. 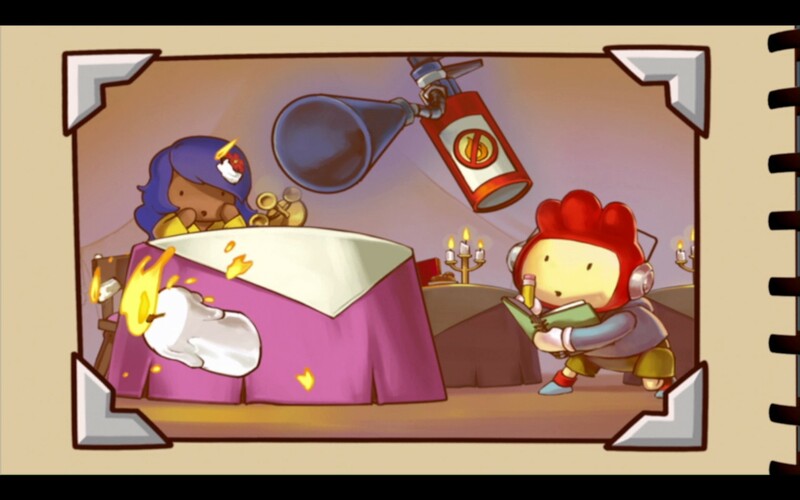 Scribblenauts Unlimited puts you in control of Maxwell, a rooster helmeted kid who’s been bestowed with the incredible power of being able to bring any object to life through the use of his magical notebook. Like any kid with unlimited power Maxwell, accompanied by his sister Lily, goes a bit crazy and starts creating all sorts of mischief. That is until an old man curses both of them and tells them that it can only be lifted should they use their powers to help out others. Strangely enough Maxwell seems unaffected by this curse but his sister starts turning to stone. Therefore its up to Maxwell to do good deeds in order to collect Starites, the only things capable of healing Lily. 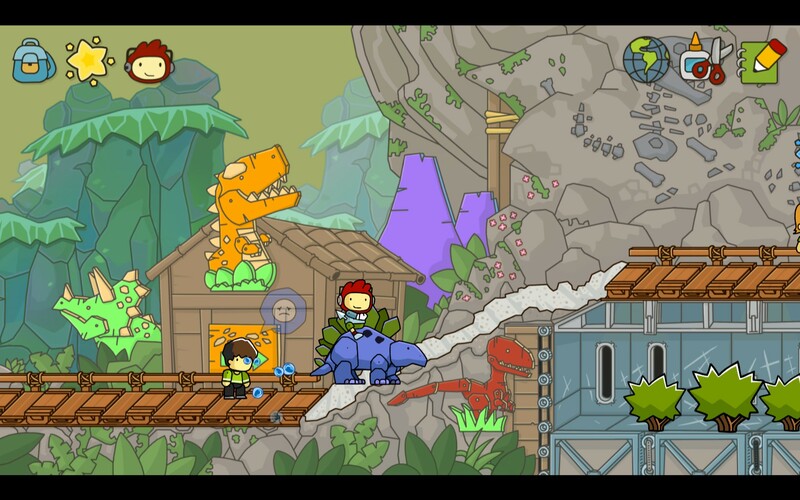 When I first started up Scribblenauts Unlimited it’s art style reminded me heavily of the flash games of yesteryear as it has similar colour palettes and animation styles. This seems to be purely coincidental however as whilst 5th Cell has a history of mobile/casual game development they haven’t made a single flash game although some of their recent titles were apparently inspired by them. The simplistic art style combines well with their sound design which incorporates a lot of subtle background music, universal voice acting (ala The Sims) and hilarious sound effects. 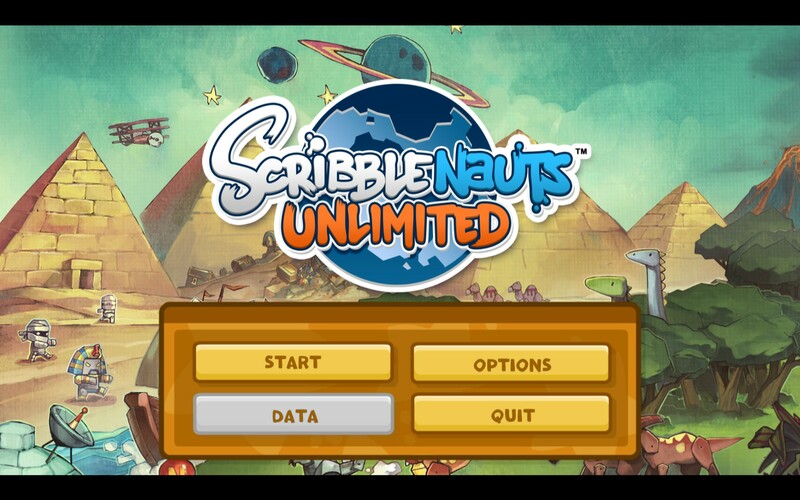 Scribblenauts Unlimited is a 2D puzzler that has a rather unique game play mechanic: you can create nearly any object you can think of by simply typing it out. So unlike most puzzlers where you either have to get a combination of items/switches/things right or search around for hours looking for the appropriate key or whatever you’re instead presented some kind of problem from a someone/thing walking around and then its up to you to come up with the most appropriate item to solve it. Since you have literally tens of thousands of items to choose from it’s usually easy to find something to get the job done, but that’s not where the fun comes from. One of the situations I can remember was a group of kids had lost their ball in an old man’s yard and wanted me to get it back for them. Easy enough I just walked over there to pick it up however the old man intervened and took the ball away from me. It’s obvious then that they want you to distract the old man so you can get the ball but I figured there was a better way. I gave myself a grappling hook and shot the ball and dragged it back to me, completing the mission. This also had the hilarious consequence of also triggering the old man to retrieve it which confused the physics engine and sent me flying across the map. You can also add adjectives to almost any object in the world which can significantly change their properties. Whilst I usually used this for hilarious effect, like creating a Bacon Narwhal or a Flying Supersonic Armoured Stegosaurus, it also made some of the puzzles incredibly easy. For instance when a kid was getting attacked by a bully all I did to solve the puzzle was add “friendly” as an objective to said bully and he turned from giver of wedgies to nerd lover. It also ends up making some rather weird objects, like if you write “psychic glasses” you get a pair of glasses that has a crystal ball stuck on the front of it. While the default Maxwell is more than capable of completing all the puzzles you’ll probably find yourself wanting to get around levels faster, especially as they start to increase in size. Most of the time I’d draw myself up a Fast Jetpack (adding fast to it doubles the speed) in order to get around better although I graduated to my supersonic flying stegosaurus after I realised they had dinosaurs coded in. It would be nice if you could use the inventory system to set up a default set of items for you as any time you reset the level you’ll lose everything, even the costumes Maxwell is wearing. In fact the whole inventory seems pointless as it’s just as fast to type things out as it is to use them from there. That’s probably a hangover from its DS origins, though. 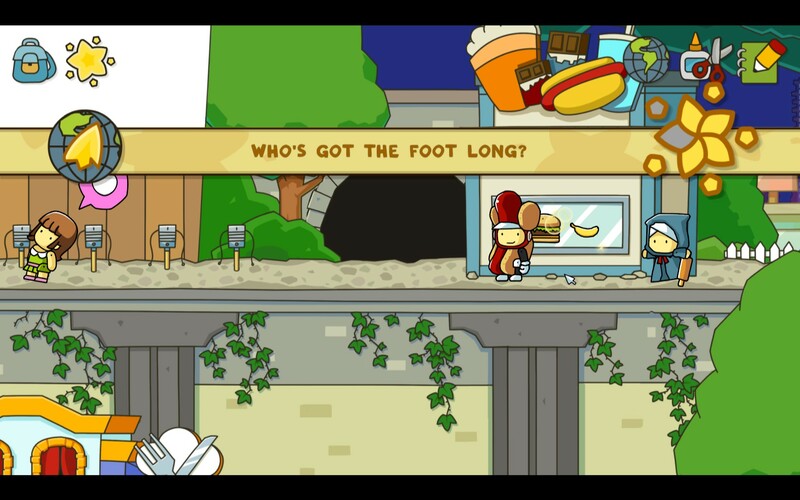 From a technical perspective Scribblenauts Unlimited is solid with the only real problems coming out of the physics engine getting into weird edge cases like the aforementioned grappling hook incident. In terms of the game play though it does get repetitive really quickly as whilst you can make all sorts of hilarious combinations it starts to wear thing after you’ve made several things that are on fire or made Cthulu fight Zeus for the 100th time. It does play well in small bursts though which, again, I think is due to its DS origins and its concurrent release on the WiiU which is arguably more aimed towards casual players. There’s also a rudimentary story but it’s really only that, serving only to provide a kind of backdrop with a moral that can be summed up as “be good to one another”. I’m not saying its bad, just incredibly simplistic and considering it really only comes into play at the start and the end means that there’s no character development at all. Of course this is a game that sacrifices story in favour game play so I won’t judge it too harshly based on that but it’s something that bears mentioning. 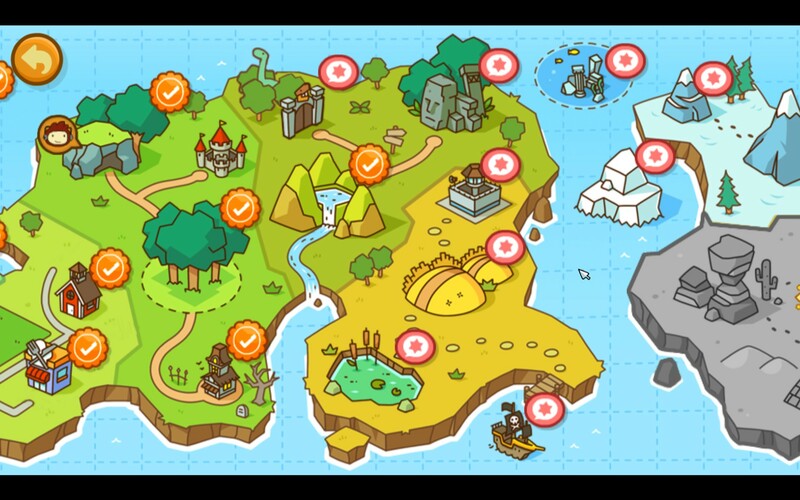 Scribblenauts Unlimited is one of those games where the emergent game play is what makes it so much fun and the puzzles just seem to be catalysts to bring on all sorts of unintended behaviour. It really is a lot of fun to solve puzzles in completely unintuitive ways, especially if the solution simply makes no sense. It does start to wear thin quite quickly however and would probably be far better positioned as an iOS title since it lends itself so well to short bursts of game play. Still it’s technically sound, very enjoyable and both visually and aurally pleasing so it’s probably worth a look in if you’re looking for a break from more traditional games. Scribblenauts Unlimited is available on PC, WiiU and Nintendo 3DS right now for $49.99, $78 and $58 respectively. Game was played on the PC with 5.5 hours total playtime and 50% of the achievements unlocked.